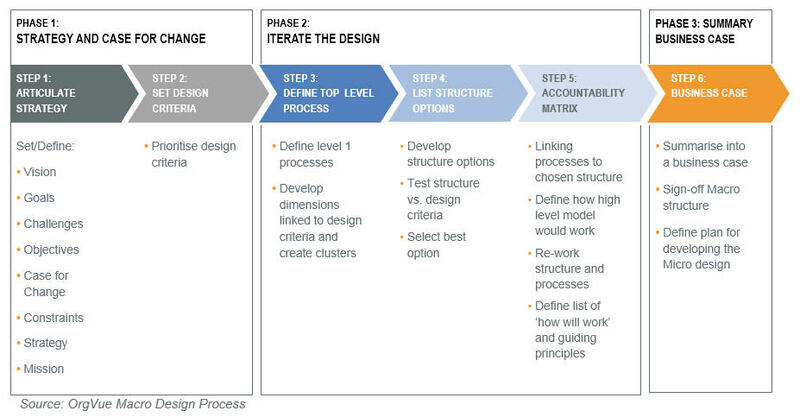 The OrgVue Macro design process is pretty straight forward. In process terms, it is far simpler than the Micro design process, because the Micro design is about the detail; the system; how it will all work. But because it is straightforward doesn’t mean it is simple. Step two of the process looks the easiest of the lot. And it is. But, it is all about choices. All too often, during a design process, I’m asked for “the solution”. As if, some sort of ideal universal nirvana exists waiting to been revealed to all. The truth is, there is no ideal. Just the best option for a given set of priorities. If you want to be close to the customer, go local and use a geographical model. If you want functional expertise, centralise. The confusion comes from trying to have your cake and eat it. From not making trade-offs. Start by using the strategy; the case for change; the prioritised goals (etc.) to list the potential design criteria. Then, rank them in order of importance. Provide an ever-decreasing score for each one as illustrated below. For each option, rank how well the option does in meeting the criteria. I like a 1,3,6,9 scale. 9 = exceeds/is brilliant. 6 = meets the goals while 3 misses it and 1 is significantly off. From this comes an aggregate score. Option 1 is at 82% of the maximum possible score which Option 3 is at 55%. In this case, Option 1 clearly wins and should be the preferred choice for further detailing. The point here is not the exact numbers. This is not an exact science but a process. It is a way to think through how well each option does in relation to each of the criteria. It is the discussion and thinking that matter. If two options would be within a couple of percentage points of each other, then they are probably the same. Is Option 3 really better than Option 2 in the above? It is more extreme with two 1s and one 9 versus the generally unimpressive four 3s and one 6. If it would be a toss-up between 2 and 3, then I would want to think through if those “1s” are show stoppers or not? Does it really perform vastly better for criteria A? I might move to another framework, like minimise my maximum regret. My point is, define a structure for evaluation but don’t be beholden to it if that structure is good enough. Refine it. BUT, and more importantly, don’t let politically agendas give a window for changing the rules of the game because that suits. Only change the rules of the game if a genuine impasses is reached and more nuance is required….I guess what I’m saying is, let a resemblance of common sense prevail without succumbing to bullying. Like all these first Macro design steps, it is all about the thinking and the debate. Don’t rush it, because it is relatively simple and don’t try to get it all done in one or even two goes. It takes a bit of time. It takes reflection. It takes iteration with steps 3 to 6 in the above process for although the process is written in a linear fashion, it isn’t in reality quite as simple as that.